in all cartoondom is Fauntleroy Fox and Crawford Crow. Not only did these two hold down a regular series from DC Comics for over 20 years (appearing in more than one title during the majority of those years) — not only did they manage that feat without a single regular supporting character — in most stories, they managed it without even a walk-on by a third character. Hundreds and hundreds of stories were about absolutely nothing except the interaction between The Fox and The Crow — and through all those years, the stories stayed fresh and funny. Artist Jim Davis (no relation to the Jim Davis who writes and draws Garfield) is most closely associated with those hundreds and hundreds of stories (tho he had help from writers Hubie Karp and Cecil Beard). Davis started out as a moonlighting animator (like many funny animal artists of the time), with credits at Warner Bros., Disney and elsewhere, but wound up making a career in comic books. The characters, too, started out in animation. They first appeared in The Fox & the Grapes, a cartoon released Dec. 5, 1941, by Columbia Pictures' Screen Gems Studio. It was the first Columbia cartoon directed by Frank Tashlin (Little Pancho Vanilla), then in the process of revamping the outfit from the ground up. The cartoon consisted of a dimwitted Fox (no relation) trying one strategem after another to reach a bunch of grapes, thwarted time after time by an obnoxious Crow (no relation). Its narrative style — quickly setting up the characters and motivations, then proceeding with a long series of very short "blackout" gags  anticipated Chuck Jones's Road Runner and Coyote by almost eight years, and has been freely acknowledged by Jones as an inspiration for his series. The cartoon was well received, and another with the same characters was produced, for release six months after the first. In fact, they became the studio's biggest stars ever, easily eclipsing Scrappy. But by then, Tashlin had departed for greener pastures — he was working at Warner Bros., and making a name for himself with such characters as Daffy Duck and Porky Pig. This one was directed by Bob Wickersham, who used the characters in a completely different way. His Fox just wanted to be left alone, but The Crow wouldn't let him; and the gags were done in a more traditional style than the earlier blackouts. Innocent Fox paired with agressive Crow became the formula for the series, most of which was directed by Wickersham. In 1948, producer Steven Bosustow, head of UPA, approached Columbia with a proposal that they out-source their cartoons — that is, buy cartoons from his studio instead of producing them in-house. Columbia, which was having trouble maintaining a stable work force in the animation department, ordered a couple of Fox & Crow cartoons from the fledgling studio. These cartoons (Robin Hoodlum (1948) and The Magic Fluke (1949), both directed by John Hubley) were made in what was then an avant-garde graphic style, and Columbia executives were a bit leery — until both cartoons were nominated for Oscars, something no Fox & Crow cartoon had ever achieved before. The Screen Gems Studio was soon shut down; thenceforth, Columbia Pictures' cartoons were produced by UPA. But UPA was apparently not interested in hand-me-downs from a defunct studio, and concentrated on their own characters (the first of which, Mr. Magoo, is the one they're best remembered for today). Their third use of the characters, Punchy de Leon (1950, also directed by Hubley) was the last Fox & Crow cartoon ever made. By then, the characters were well established in comic books. DC had licensed the Columbia cartoon characters in 1945, and launched a new title, Real Screen Comics, for them to star in. The other series in Real Screen were Tito & His Burrito (containing stereotyped characters which, while not ill-intended, would not be used today) and Flippity & Flop (a cat-and-bird series strongly reminiscent of Tweety & Sylvester). The latter two series appeared in only one story each per issue, while The Fox & the Crow filled most of the book. The comic book version was only slightly different from Wickersham's cartoons. Fauntleroy Fox and Crawford Crow had no neighbors except each other, Crow's disreputable, multi-story hollow tree standing only a few paces from Fox's nicely-maintained, comfortable house. Most stories started with Crow, a charming low-life, trying to trick the wealthy, establishment-type, but insufferably smug Fox out of something — but not all, as many were driven by Fox's desire to harm Crow in some way, or just to get away from Crow. Stories could end with either character triumphant, or both, or neither. Both used disguises frequently — painfully transparent ones to the reader, but seen through by the other character only when the plot required it. Extraneous characters occasionally appeared, but were mostly used as props — a delivery man, policeman, or other functionary might show up for a few panels, only to be shuffled off-stage as quickly as possible. The title characters were so right for each other, their fit could be seen even in their physical appearance — when (as often happened) they confronted each other eyeball-to-eyeball, Crow's convex beak dovetailed perfectly with Fox's concave snout. In 1948, DC converted Comic Cavalcade, where The Flash, Green Lantern and Wonder Woman had been sharing the covers, from superheroes to funny animals. The Fox & the Crow were among the new stars, sharing covers with Nutsy Squirrel (star of Funny Folks) and The Dodo & the Frog (from Funny Stuff). 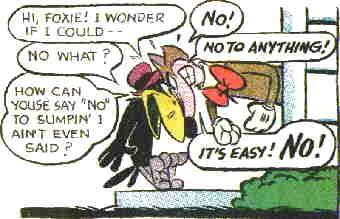 The Fox & the Crow got their own comic in 1951, over a year after their last cartoon appeared. From then until 1954, when Comic Cavalcade folded, they were cover-featured in three DC titles. Real Screen Comics changed its title to TV Screen Cartoons in 1959, and folded in '61, leaving The Fox & the Crow starring only in their own comic. The 1960s were hard years for funny animals in comic books, especially those no longer supported by regular appearances in other media. In 1965, the comic's long-running back-up series, "The Hounds & the Hare", was dropped, and DC started experimenting with new concepts. "Stanley & His Monster", by Arnold Drake and Winslow Mortimer, which started in the 95th issue (Dec-Jan, 1965-66), was a little different from the others, in that it debuted in the lead position. All of a sudden, The Fox & the Crow had become back-ups in their own comic. The former stars soon started getting crowded off the cover, as well. As of #109 (May, 1968), the comic's title was officially changed to Stanley & His Monster, and The Fox & the Crow were gone for good. Today, the two dozen or so Fox & Crow cartoons are seldom seen, even in out-of-the-way TV slots. Because of issues concerning ownership of the characters, the comic book stories are seldom if ever reprinted. But for collectors and connoisseurs of old comic books, those hundreds and hundreds of stories still provide ample laughs. Text ©2000-07 Donald D. Markstein. Art © Columbia Pictures.